Considered by many in the industry as the gold standard of radiation-proof cameras, Diakont’s D40 offers the perfect mix of high resolution, small size, and high radiation tolerance required for reliable, precision performance in an extreme environment. Due to its compact diameter of just 1.58”, this camera is perfectly suited for the inspection of confined areas like reactor component interiors. Its modular design and range of attachments makes it the ideal “utility camera,” in which a single camera system can be reconfigured to support all types of plant operations and maintenance. This flexibility offers users the highest level of economy and best value for their investment. The D40 is also offered as an integrated system solution, complete with camera, processing system, and user interface. Due to its innovative technology and proven reliability, the D40 camera system has won deserved popularity from nuclear power plant builders, contractors, and operators worldwide. Today, over 1000 systems have been deployed in Russia, the United States, Japan, France, Finland, and other countries. Unlike bulkier shielded cameras, the D40’s optimized split-head design makes it both extremely compact and naturally resistant to radiation. Minimal electronics are located inside the camera itself and only non-browning optics are incorporated. The majority of the camera system components are housed in the topside camera control unit (CCU). These capabilities make D40 operation extremely easy and convenient, when compared to that of traditional radiation-hardened cameras. With its small size and intuitive design, the D40 camera system is easy to use in both air and water environments, and perfect for accessing tight spaces. Using its wide variety of lenses and attachments, the operator can perform axial, lateral, and circular scanning. During inspections, the camera is often “puppeteered” into position in hard-to-access locations using its own cable, or can also be maneuvered using pan/tilt or a robotic manipulator. Like all of Diakont’s products, the D40 is designed and manufactured to stringent quality standards. All stages of the production cycle through final factory acceptance testing of the finished products are performed under the tight parameters of Diakont’s ISO 9001-certified Quality Management System. High camera reliability is achieved through solid design and meticulous selection of the highest quality components. Diakont routinely performs radiation tests on components and completed camera systems in order to validate performance to specifications. Offering unparalleled ease of maintenance, D40 replacement camera tubes and tuning boards are paired at the factory and pre-tuned prior to shipping. 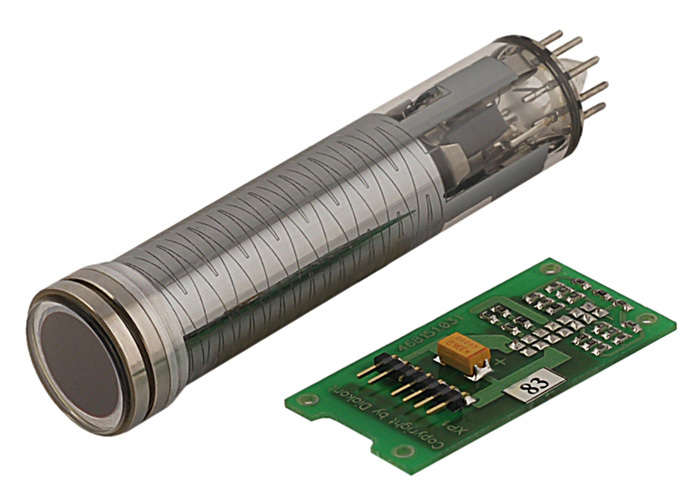 This feature supports “plug and play” tube replacement, eliminating labor intensive field tuning requirements, and ultimately saving hours of camera tuning per tube change out. For applications with extremely high gamma fields, the D40 is available with an ultra-rad tube with a dose rate of 3*10^6 Rads/hr. These applications include control blade inspections, irradiated fuel assembly inspections, in-air reactor vessel and internals inspections and more. 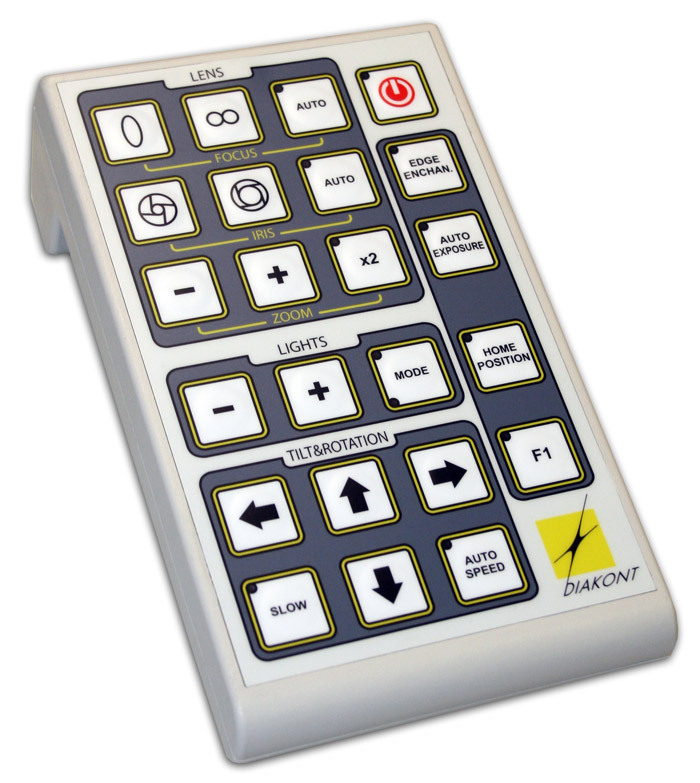 The D40 has an optional hand-held remote control console that can be plugged into the CCU for remote operation. This accessory is ideal for operators that rack mount the CCU and don’t want to stand next to the rack to control the camera functions. The D40 system is also capable of remote operation via a serial or other network interface for operation outside of containment. 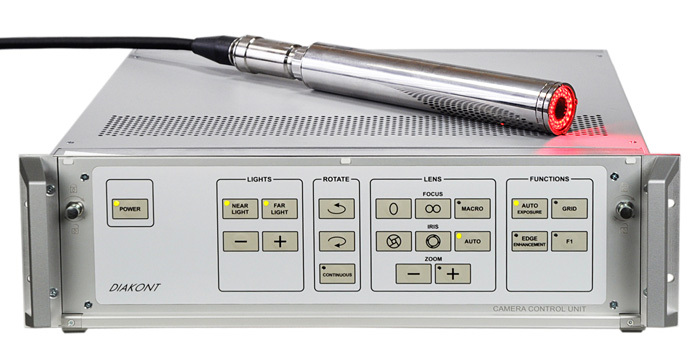 An On-Screen Display (OSD) measurement module is available for the D40 that provides distance to target measurements. The OSD module also provides a scaled grid on the screen allowing operators to measure the size of viewed objects. In addition, the OSD module allows operators to annotate screen-captured images providing a permanent record for future evaluation and analysis. 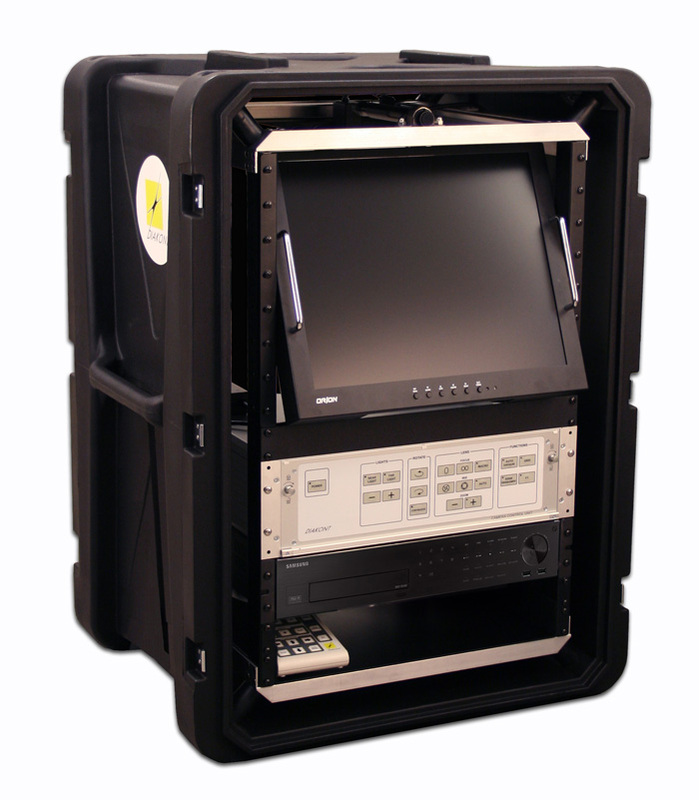 Diakont’s D40 console system incorporates the best-in-class D40 rad-hardened camera along with a rack-mounted camera control unit, a monitor, a digital video recorder (DVR), a microphone, and a handheld remote controller, all integrated into a rugged enclosure.